There is laser mark (#1,#2,#3……) on lower right corner of ignition (front). There are “DLE”and 7 digital serial numbers and “date of manufacturing” marked on the side of ignition. Cap of spark plug has a “DLE” mark. The parting line of Genuine DLE engine cylinder is clear and smooth, no machining mark. Fake engine cylinder: the parting line is very rough and cooling fin is machined after molding. 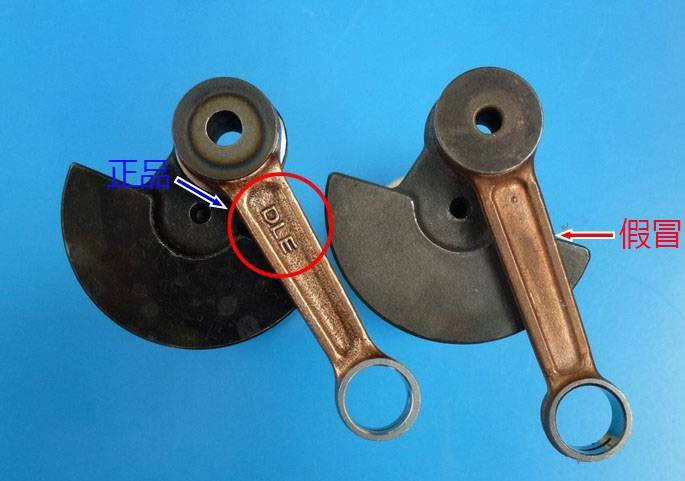 All connecting rod of genuine DLE engine are marked with DLE logo, Fake engine has no “DLE” mark on the rod. User Manual for Genuine DLE Engine shows a clear contact details. The DLE engine exclusive manufacturer is Mile Hao Xiang Technology Co., LTD, and the content of manual in box is exact same as the manual that downloaded from DLE official website. The fake DLE User Manual normally covers or changes the contact details of original manufacturer. ow to avoid purchased a fake DLE Engines? DLE has no branch or sub-contracted; DLE has no factory or official dealer in Hongkong. Most of fake DLE engines are selling from on-line shops like eBay or Amazon, DLE company will not take any responsibility and provide service to fake DLE engines. The fake engine manufacturer may build it even more similar to genuine DLE engine in future, so we strongly suggest to purchase engines from DLE authorized dealers or retail shops only. If you have a doubt for the engine you purchased, please do not hesitate to contact us. Woah! I’m really loving the template/theme of this website. It’s simple, yet effective. A lot of times it’s hard to get that “perfect balance” between usability and visual appeal. I must say that you’ve done a very good job with this. Also, the blog loads very fast for me on Opera. Outstanding Blog! The simplicity of the site, is very well thought out. Pictures and drawings, well detailed. Good job. I did not find a list of dealers. Also , on most forms I’ve seen in regards to the DLE twin cylinders and DLE 4 cylinder 222 -no electronic start. Your customers are asking, but no advancements to the engines. With the Larger electric motors and batteries down in price, are you not missing out on an opportunity by not having them available, even as an add-on. Now we are developing the new products , you will get the products which you expect at the end of this year . I simply want to mention I’m new to blogging and site-building and truly liked you’re website. Almost certainly I’m planning to bookmark your website . You definitely come with beneficial articles. Many thanks for sharing your website.